When looking up images for the 1964 Imperial that Don Draper drove in an episode of Mad Men, I stumbled upon a 2006 concept car that has the new Lincoln Continental beat by a wide margin in the Bentley-lookalike category. When Lincoln lifted the cover on the 2016 Lincoln Continental concept last year, the first car everyone was immediately reminded of was not something a Kennedy died in. No, everyone either scolded or praised Lincoln for making the new Continental look pretty damn convincingly like a budget Bentley. The reaction was so strong that a Bentley designer even took to Facebook to call out Lincoln for copying similar styling elements from the British Luxury marque, offering Lincoln use of Bentley’s product tooling. Well Lincoln didn’t really care and brought the Continental to production as close to the concept as production cars get these days, and everyone else moved on. But perhaps the initial reactions overlooked something. That something being the 2006 Chrysler Imperial Concept. Introduced as a vision for a luxurious Chrysler flagship car, the Imperial Concept came with a 5.7 liter Hemi V8 and the looks of a Chinese Bentley knock-off. From the double-headlight housings, the big vertical almost-square grille, and the ridiculously large rear fender accent line are quite convincingly derivative, if not identical, to similar Bentley design trends. Even the wheels are almost identical! 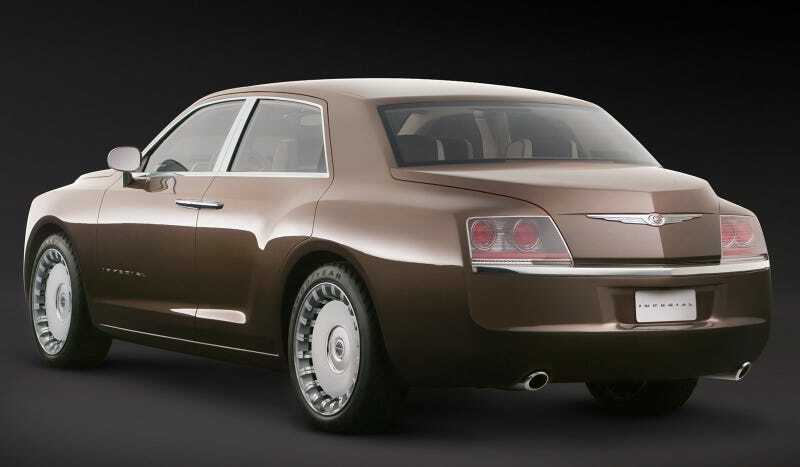 The 1998 Chrysler Chronos concept had similar features as well, but the boxy body of the Imperial is clearly less of Chrysler’s heritage and more of Bentley’s. I initially thought it was the concept for the modern Chrysler 300, but that car was already for sale when the Imperial Concept dropped—not that the 300 doesn’t get called out for looking like a Bentley too. By Drake of all people. I just thought I’d point out that the Continental wasn’t the first to look to the mega-yachts for inspiration. And thankfully, Lincoln did a much better job doing it than Chrysler did back in ‘06.